With the 2017 NFL draft right around the corner, let’s take a look at the top prospects at the tight end position, filled with some freakish talent. Make sure to keep an eye out for these guys at the NFL scouting combine, beginning February 28th. O.J. Howard stands approximately 6 feet and 6 inches tall at 250 pounds but plays the game more like a wide receiver and looks the part of an NBA power forward. Howard came out of high school as a number one recruit and was heavily sought after by Alabama. Howard displays exceptional athleticism with quick nimble feet and nice technical handwork off the line making him incredibly difficult to get a hand on in press. He is a good blocker who shows glimpses of being a fantastic blocker at times with his large size and long arms to extend and push back defenders. He displays some decent route running but could definitely use some work as he tends to rely heavily on his superior size and athleticism to get by defenders. Playing for Alabama, Howard didn’t necessarily get to showcase, but for a handful of times, the incredible talent he possesses, due to the amount of talent on a run heavy team such as the Crimson Tide. He is a natural catcher of the ball with long muscular arms combined with strong hands to snag the ball midair. Howard possesses good speed, agility, and great field awareness making him incredibly dangerous after the catch due to his size and ability to escape tacklers. 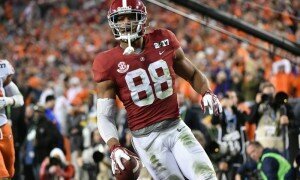 O.J Howard is the cream of the crop at the TE spot with a lot of room to grow which should surely make him the first of his position off the board come draft day. David Njoku is an absolute freak of an athlete as well as having an extremely long muscular frame for the TE position. He came out of high school as the national high jump champion clearing nearly seven feet. Possibly the fastest and most athletic of all the tight ends, Njoku shows elite acceleration in and out of his routes helping to create separation, leaving open throwing windows for quarterbacks. Njoku only started nine games in two years for the hurricanes so inexperience at the position is a large factor as he struggles with blocking against above average pass rushers, getting pushed back into the play at times. His route running isn’t anything to write home about but that is something that he can develop relatively quickly, being such a raw freakish athlete. The fact that he is too athletic and fast for linebackers to guard and too big and strong for defensive backs results in mismatch nightmares for opposing defenses. With Njoku’s ceiling seemingly limitless, watch out for the next great Hurricane tight end to make some noise at the combine as well as the gridiron on Sundays. Everett was relatively unknown as a football player due to the fact he grew up playing basketball. Naturally, no big-time schools were knocking feverishly at his doorstep, considering he only played one year of high school football. Don’t let the inexperience fool you. 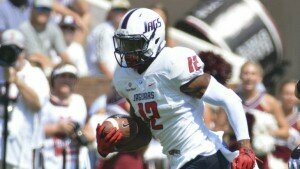 After a small stint at UAB, then transferring to South Alabama, in two seasons as a starter for the Jaguars he garnered first team all-Sun Belt both years, snagging 90 receptions for over 1200 yards and 12 touchdowns. Everett shows some decent promise as a blocker for being so new to the position as he shows ability on film to engage and sustain blocks better than most of the tight ends in this class. His route running definitely needs work as his cuts tend to be rounded and somewhat lackadaisical knowing his athleticism will most likely win him any battle he is confronted with. He is a terrific hands catcher with long arms and large catch radius high pointing throws and snatching the ball rather than body catching to secure the catch. He has a long and somewhat lanky 225-pound frame which is small by NFL standards so putting on some weight and strength will be a priority moving forward, not so much however to limit his mobility and athleticism. Everett will create some interesting mismatch problems with his terrific athleticism and body control, look for his basketball background to be on display in the redzone with jump balls to the corner of the end zone being an area he can excel at. Evan Engram is Ole Miss’s all-time leading receiver at the tight end position and without a doubt was the most productive tight end in the nation this past season, something his first-team All SEC as well as first-team All American honors can attest to. 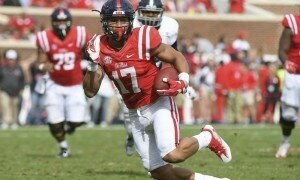 Engram looks to fit the part of a bigger more physical receiver rather than a tight end. With his sharp route running ability, above average speed, and experience at the position, he can be a very versatile weapon with the ability to line up all over the field and always have some sort of advantage over the defender trying to cover him. He has above average hands but tends to have focus drops in anticipation of running after the catch rather than zeroing in and securing the catch. Engram can be very dangerous after the catch as well with his receiver-type move set, agility and field vision. He uses his vertical speed to eat apart the seams using his uncanny ability to find holes within the defensive coverage. Despite his size, Engram can deliver some decent blocks with his quick burst and pop but needs to engage and sustain his blocks better rather than just giving a quick nudge and letting the defender get bye. In the right system Evan Engram can wreak some serious havoc wherever he lines up on the field. Bucky Hodges is not your typical tight end considering he is a converted quarterback who has only played the position for three years, making him really a boom or bust type of pick. But standing approximately 6’7” and weighing 245 pounds with some of the most freakishly athletic ability for a guy that size, his potential room for growth seems infinite. Much like the number one and two guys on this list, Hodges looks the part of a very large wide receiver. He has exceptional agility and speed for a guy his size with the ability to juke would be tacklers after the catch and to turn up field outrunning defenders. His quick feet and sheer strength enable him to get off the line in press and accelerate fluidly into his route. With his rare combination of size, strength and athleticism, he looks to play the part of a TE who will destroy the seams at will with massive catch radius, big body, and his ability to run past linebackers to find that hole in the D. He will need a lot of work with his route running such as jab steps, head and shoulder fakes and overall knowledge of the route tree as he isn’t very polished. At Virginia Tech he wasn’t utilized on a consistent basis so his blocking isn’t quite where it should be either. This is something that with the addition of body mass to his somewhat lanky frame, as well as the right mentor in his corner, can be developed relatively fast.